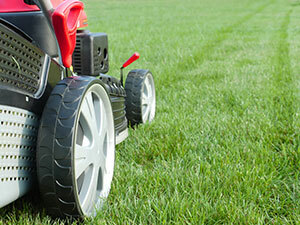 Brilliant lawns lawn care programmes are designed to develop and maintain your lawns in excellent health year round. Our fertilisers are balanced and aim to help the roots grow making healthy grass plants and a great looking lawns. We DO NOT put high nitrogen only feeds on your lawn, whilst you may be amazed in the short term these unbalanced feeds will in time lead to a poor stressed lawn. We offer 3 lawn programmes. 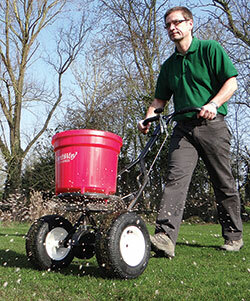 The most popular is our silver service which includes scarification and aeration. Disease and Pest management available regardless of programme choice. -Scarification. This mechanical process removes thatch from your lawn. Thatch is made up of all sorts of materials dead moss and decaying materials. Thinning out this thatch by scarifying allows air and nutrients easier access to the soil. Water will penetrate the surface carrying moisture and much needed nutrients to the roots. You will see the difference the following year as grass has the space to grow and is healthier and stronger. We apply a post scarification treatment which aids recovery, controls any moss that's left and strengthens the turf. -Aeration improves the root zone by allowing water, nutrients and air to better penetrate the surface. 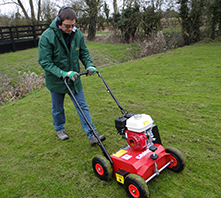 The machine makes hundreds of small holes in your lawn, which significantly improves the drainage, relieves compaction and creates less favourable conditions for moss. We use either solid or hollow tine aeration subject to your turf conditions. -The LESS Mowing treatment is a growth regulator that reduces the number of times you have to mow your lawn, freeing you up to do the things that are important to you. An additional benefit is that the grass sward thickens. It does this by encouraging the grass plant to tiller (grow) sideways which thickens sward, increasing density and improving drought tolerance. You save time to do the things you enjoy. LESS mowing means less wear to your mower thus reducing maintenance and running costs. -Water Optimiser treatment helps to manage the distribution of moisture in the soil, regardless of whether it is a wet or dry year. In dry periods the main problem is loss of moisture from the surface by evaporation. The treatment helps the available moisture penetrate downwards through the soil. Water remains available to the roots at a deeper level rather than dissipating. - Feed your lawn using our organic based granular product which provides all the early season nutrients required to kick start the lawn at the beginning of the growing season. It naturally releases nutrients over a period until the Early summer treatment is due. -apply a selective herbicide to control weeds such as dandelions, clover, daisies, buttercups, plantains and speedwell. This product is absorbed by the leaves and carried throughout the plant thus killing the plant and roots. -Fertilise using our phased release organic based granular product designed to feed the lawn, green it up and aid root growth to improve lawn health and drought resistance. The phased release means that nutrients will continue to be released until the next treatment is due. - Apply a selective herbicide to control any broad leaved weeds that remain. - Fertilise using our phased release, organic based granular product which provides nutrients over an extended period through to autumn thus maintaining the health of the lawn. - A micro nutrient treatment which will green up the lawn kill moss, and toughen the grass ready for winter. This is good preparation for for any aeration and scarification to come. Once we have completed the work, we leave a treatment sheet and then send an invoice by e-mail (or post)You can pay using on-line banking or send a cheque the details are all on the invoice. If you prefer, you can of course pay when we call and have completed the work. We are passionate about lawn care and eager to provide the very best service and in addition we offer a Money Back Guarantee. If you are not satisfied with a treatment we will either put it right or refund your money.